Painter, printmaker, educator, and author, Leonard Edmondson studied art at the University of California at Berkeley. Between 1942 and 1946, Edmondson served in the U.S. Army in Military Intelligence. 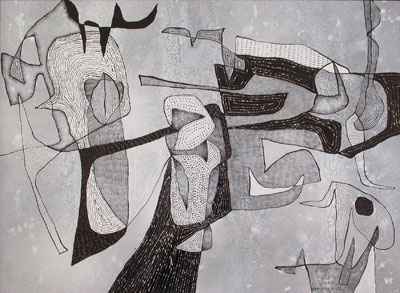 Very importantly, his travels through Europe enabled him to personally experience an extensive body of work by Paul Klee, which proved influential on his work. Immediately after the war, Edmondson explored the collections of the Louvre. Edmondson would develop a style that was distinctive from the abstract surrealism of Max Ernst and the expressionism of Hans Hofmann. Edmondson's aesthetic vocabulary invokes forms, feelings and spaces in his paintings, watercolors, etchings and his screen-prints. These almost-remembered forms can readily be seen in the work on display, Untitled XIV. When he returned to California in 1947, Edmondson accepted the first teaching position of his distinguished career at the Pasadena City College. Edmondson subsequently taught at the Otis Art Institute, University of California at Berkeley, Pratt Institute, and was ultimately appointed Chairman of the Printmaking Department at California State University in Los Angeles, where he remained until his retirement in 1986. His first solo museum exhibition at San Francisco’s De Young Memorial Museum in 1952 was followed by solo exhibitions at the Pasadena Art Museum and the Santa Barbara Museum. He was honored with two Tiffany Fellowships and a Guggenheim Fellowship. In 1967, the San Francisco Museum of Art held a retrospective of his work. Soon afterward, in 1970, he published his technical treatise, Etching. Edmondson was a member of the California Watercolor Society and the California Printmakers Society. Indicative of his philosophies, Leonard Edmondson wrote: "I am equally concerned with what I want to say and the formal values I use to say it. My painting is not art of rebellion but one of discovery and sharing. I have found satisfaction in the spontaneous, often compulsive, active of drawing and painting." Edmondson’s work is represented in the collections of the Bibliothèque Nationale, Paris; Victoria and Albert Museum, London; National Gallery, Washington, DC; Metropolitan Museum of Art; Brooklyn Museum; Cranbrook Academy of Art, Bloomfield Hills, MI; Herbert F. Johnson Museum of Art at Cornell University, Ithaca, NY; Dallas Museum of Fine Art; Detroit Museum of Art; Los Angeles County Museum of Art; New York Public Library, Oakland Museum of California Art, Pasadena Art Museum, Philadelphia Museum of Art, San Francisco Museum of Modern Art; Seattle Art Museum; and the Worcester Art Museum, MA. 20" x 28" Framed: 28" x 35.5"